Oh how I love cinnamon. I add it to just about anything. I’m not just talking about cinnamon rolls and pies, I mean stuff like cereal or ice cream. Have you tried it on ice cream? You should, it’s amazing. Anyway, to me, cinnamon just makes anything better. 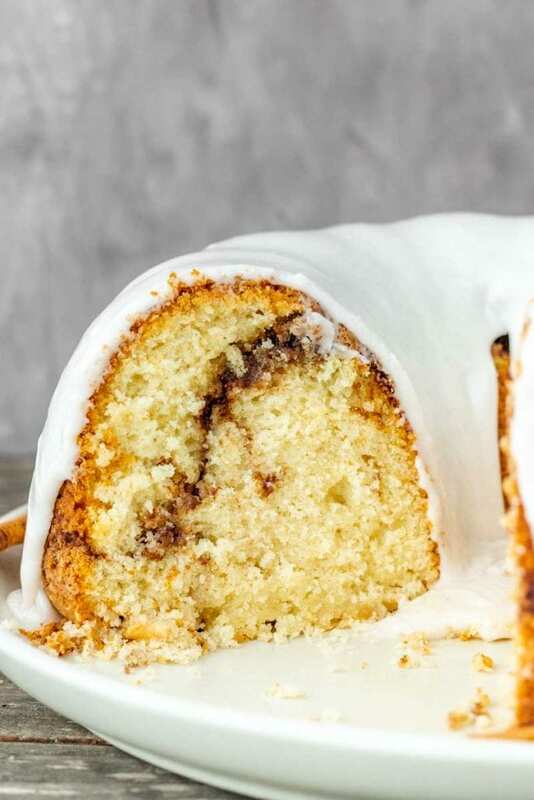 This Cinnamon Swirl Sour Cream Cake has got some major cinnamon swirl going on. 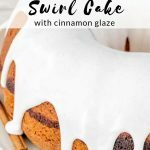 This one’s super moist, thanks to the help of sour cream, then it’s covered in a smooth cinnamon glaze. 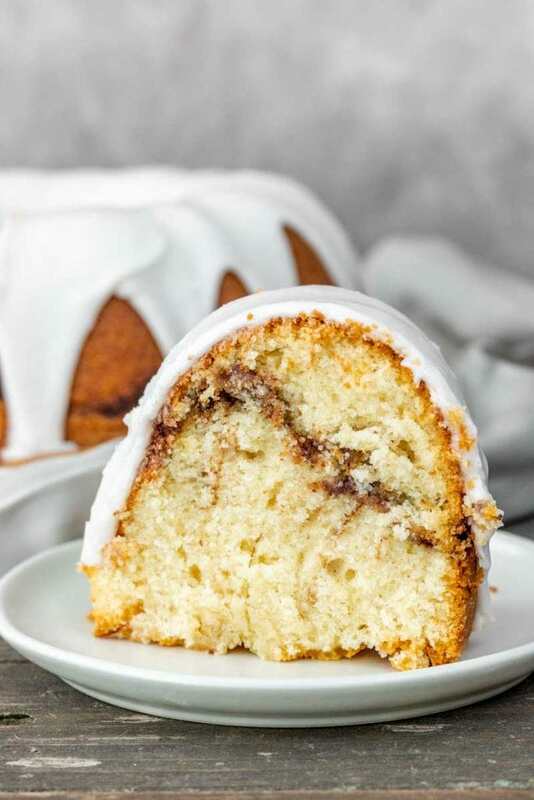 I couldn’t decide whether to call this one cinnamon swirl sour cream cake, or actually just cinnamon roll cake because it seriously tastes like a straight up cinnamon roll. 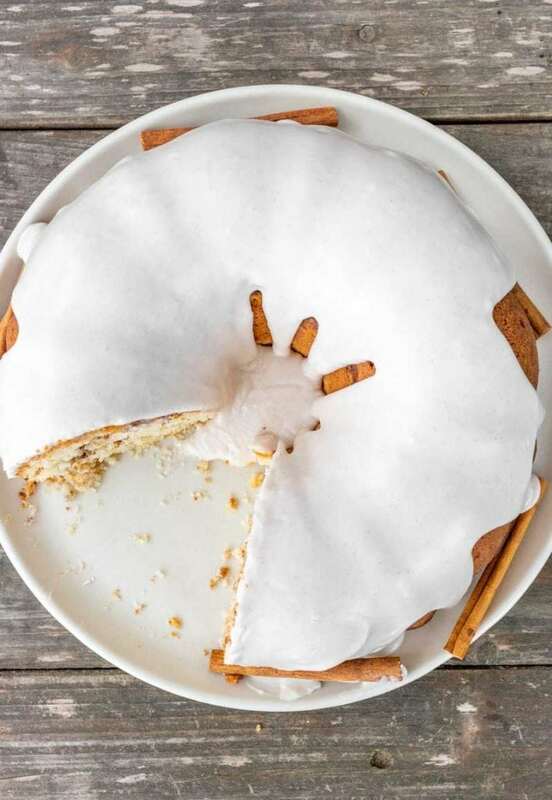 This cake comes out of the oven with a river of cinnamon running throughout the middle. It gives you a good mouthful of brown sugar cinnamony goodness. 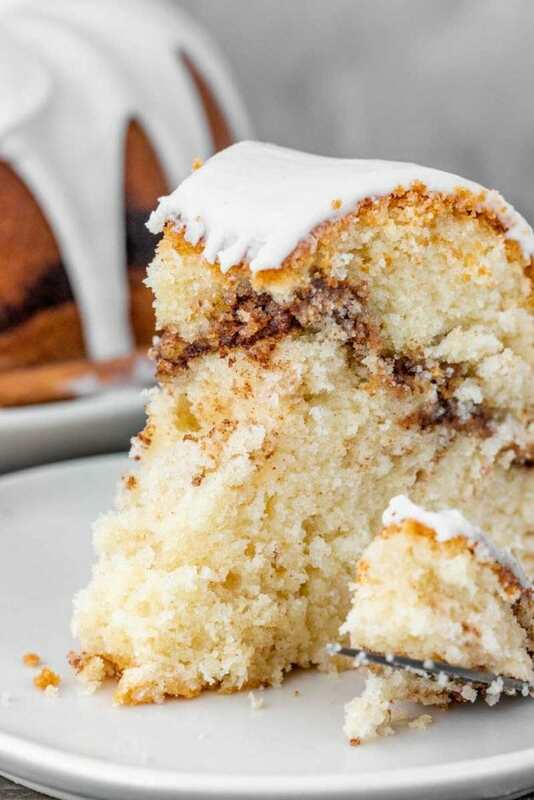 And if you want even more swirl than my cake has, feel free to swirl your batter a little more. You just want to be careful that you don’t go crazy, or you’ll lose the swirl effect. 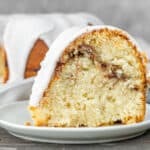 Any time is a good time to have cinnamon cake, but it’s especially good during the holidays, because seriously this cake tastes like a mouthful of Christmas. 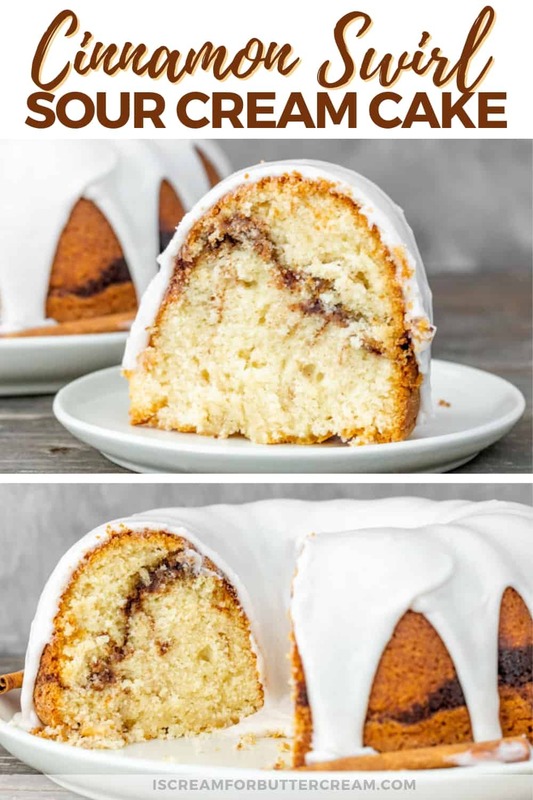 Oh and the cinnamon swirl is really simple…literally just brown sugar and cinnamon, but it packs a good punch. 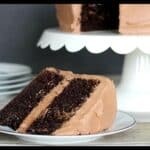 The mixing method for this cake is the creaming method. 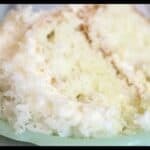 You’ll be whipping the butter and sugar until fluffy and then adding in the dry and liquid ingredients alternately. Easy Peasy. 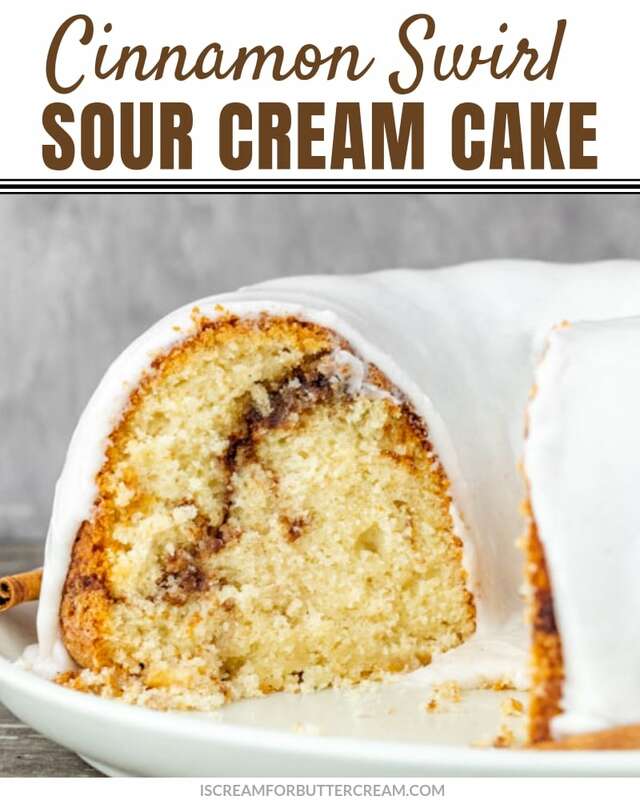 This Cinnamon Swirl Sour Cream Cake has got some major cinnamon swirl going on. 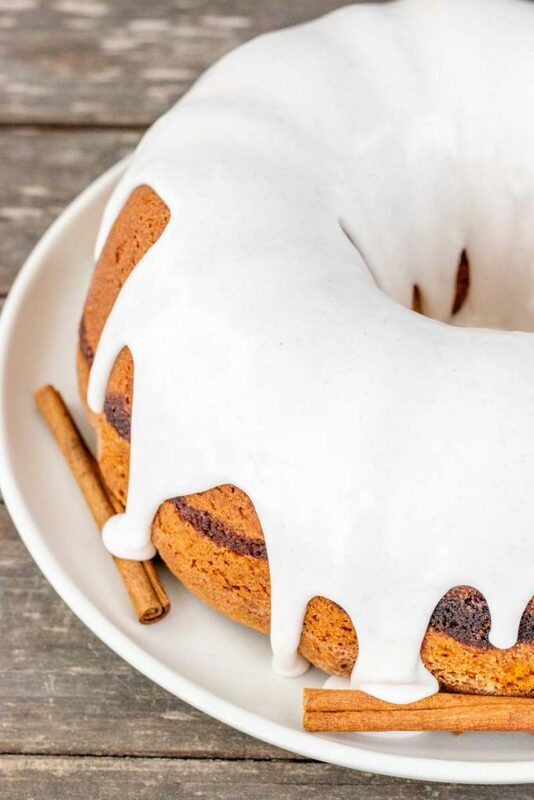 This one's super moist, thanks to the help of sour cream, then it's covered in a smooth cinnamon glaze. Grease and flour a bundt pan well. Preheat the oven to 325 degrees. In a mixing bowl, combine the flour, baking powder, salt and 1/4 tsp of cinnamon. Whisk well and set aside. In another bowl, add the sour cream, milk and vanilla. Whisk well and set aside. In a large mixing bowl, add the butter and 1 3/4 cup of regular sugar. Mix on medium and then on medium high for several minutes until light and fluffy. Add in the eggs two at a time and mix on medium just until combined. Alternately add in the flour mixture and the sour cream mixture. (Add in 1/3 of the flour mixture and mix on medium just until combined. Add in 1/2 the sour cream mixture, mixing only until combined. Add in another 1/3 of the flour mixture, mixing only until combined. Add in the last of the sour cream mixture, mixing only until combined, then the last of the flour mixture and mix until well combined.) You only want to mix until well combined, about 20 seconds. Mixing for several minutes is too long. In another bowl, mix together 1/2 cup packed brown sugar and 2 tbsp of cinnamon and set aside. Add a little less than 1/2 of the cake batter to your pan and smooth. Sprinkle the sugar, cinnamon mixture over the batter. Add the remaining cake batter into the pan and smooth. 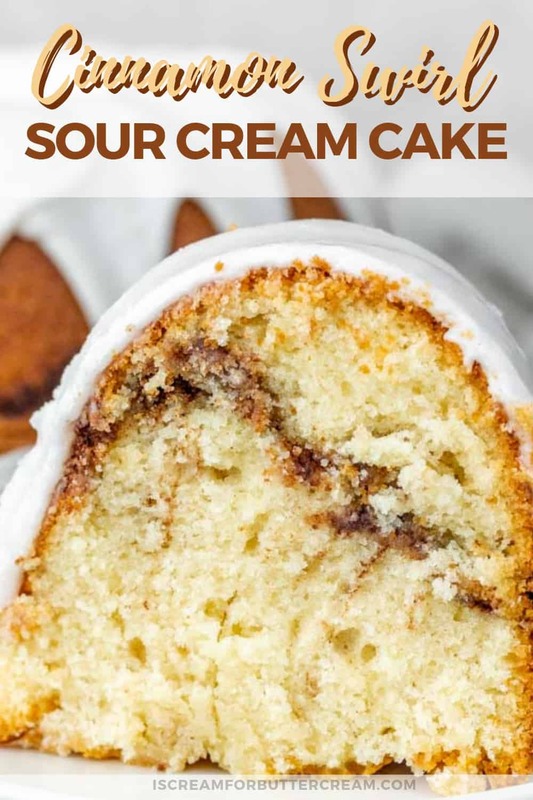 Take a knife and gently swirl the batter around. Just go around a couple of times. If you want more of a swirl, go ahead and swirl a bit more. You just want to be careful not to swirl too much or it'll mix completely together and you will lose the swirl effect. Bake at 325 degrees for about 55 minutes to 1 hour. Cool in the pan on a wire rack for about 20 minutes, then turn out of the pan and onto a rack or a cake plate and cool completely. In a mixing bowl, add in the confectioners sugar, cinnamon, extract and milk. Mix well until smooth. Check the consistency. 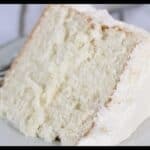 If it's too thick for drizzling, add more milk or cream by tablespoon until desired consistency. I love cinnamon! 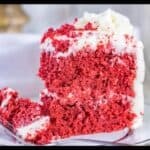 Can this cake travel? We drive to my in-laws for Christmas each year; but it is a 14-hr drive. Any suggestions for getting the cake there while making sure it is still edible a day or two after arrival? Thanks for adding video, too. Thank you! I have a cake carrier already, so I’m all set. I might have to do a ‘test’ cake next week, just to be sure.